As surely as day follows night, in a bear market environment, you will repeatedly hear the clarion call to “get defensive,” or to buy “consumer staples”. Ignore this call, individual investor, as it is merely a b-school trope that all the talking heads like to trot out in tough times to justify what they’re doing by investing other people’s money in the first place. The basic premise of getting defensive is that in an uncertain economy, consumers will continue to spend on items and services that they can’t live without, like healthcare and food. Fine, we agree…but here’s the problem: If things are bad, the stocks of those staple and healthcare providers will decline right alongside everything else when people are pulling their money out of the market. 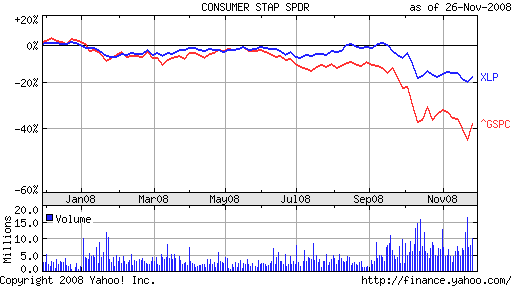 See the chart above for a comparison of the Consumer Staples Index (XLP) versus the S&P 500 during our most recent bear market in 2008. As you can see, owning staples kept you protected until the market got really ugly, and then all bets were off, with the staples losing you 20% in a matter of weeks. Sure, they came down less than the broader market, but is losing less what you really put your hard earned dollars in the market for? The pundits, fund managers, analysts and experts on business television or in the newspapers will never tell you to sell or short the market, and this is because their very appearance in the media is a pitch to retain assets or bring in new investors. Based on many of their charters, these managers must themselves remain fully invested at all times for their funds, and so they have to be recommending something, regardless of the environment. Recommending defense is like splitting the difference; they can be cautious without betraying their job description and purpose. That being said, in an environment where all assets are experiencing a weakening of demand, stocks included, there is nothing wrong with choosing defensive investments over growth, but there is also nothing wrong with getting more liquid, or even betting against the market with a portion of your portfolio. It is easier now than ever before for the individual investor to play the downside along with the upside, thanks to the advent of short and ultra short ETF’s, the increased awareness of options strategies, and the multitude of bear market fund products that have become available at the retail level. The next time the talking heads come out in a time of uncertainty and assure everyone that they’re being defensive, remember that you have other alternatives to just “losing a little less” by following their advice. January 1, 2009 Graduating in a Bear Market? Wall Street's Not Hiring.